Over the summer the Division of Information Technology staff has been hard at work, striving to make technology more accessible and developing more ways to help Bobcats succeed. Starting in the fall 2018 semester, the Wi-Fi networks have been refreshed with new names and different access points in an effort to improve performance, security, and make connecting to the networks more intuitive. Logging in couldn’t be easier! Just connect to TXST-Bobcats using your NetID and password. If you’re in the dorms, you can also access TXST-Home, a network designed specifically for devices that only require a password, like gaming systems and streaming devices. If you have family or friends visiting there’s also a network for them. 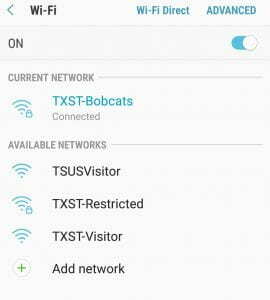 TXST-Visitor offers family and guests Wi-Fi access via a text message code that allows them to log in. If you have questions or need assistance connecting, check out the Wi-Fi support page on the IT Assistance Center’s website. This entry was posted in DOIT News and tagged internet, texas state, Texas State University, txst, wi-fi, WiFi by Nicholas Dunlap. Bookmark the permalink.